UnitedHealthcare today issued a scam alert in response to reports of a number of calls attempting to solicit personal information from railroad workers. After months of waiting, Ronald L. Batory was sworn in on Feb. 28 as the new administrator of the Federal Railroad Administration (FRA). The former COO and president of Conrail was nominated by President Donald Trump in July 2017 to lead the FRA. However, U.S. Sen. Chuck Schumer (D-N.Y.), the Senate minority leader, placed a hold on Batory’s nomination in an attempt to work out federal funding for the multi-billion-dollar Gateway Tunnel project between Schumer’s home state and New Jersey. 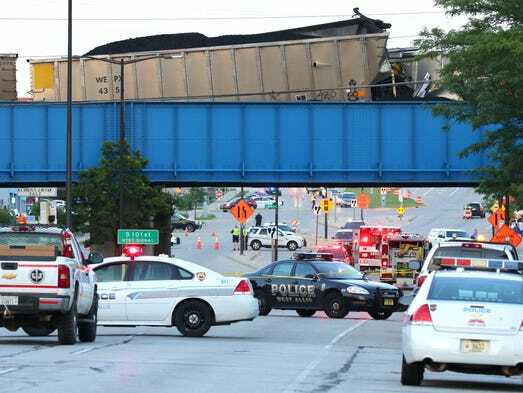 WEST ALLIS - Defective or missing ties on the tracks caused a coal train to derail in 2017, raining coal down onto Greenfield Avenue from the railroad bridge, according to a report to the Federal Railroad Administration from Union Pacific railroad. The 145-car train derailed near 105th Street with five of the loaded derailed cars on the bridge over busy Greenfield Avenue. The train was headed north when the poor tie conditions caused 21 loaded coal cars to derail, the report said. The derailment caused nearly $1.12 million in damage, the railroad estimates. Equipment damage was put at $684,510 and track damage at $480,686. Greenfield Avenue was closed to traffic after the derailment that happened about 5:20 p.m. Thursday, July 6. 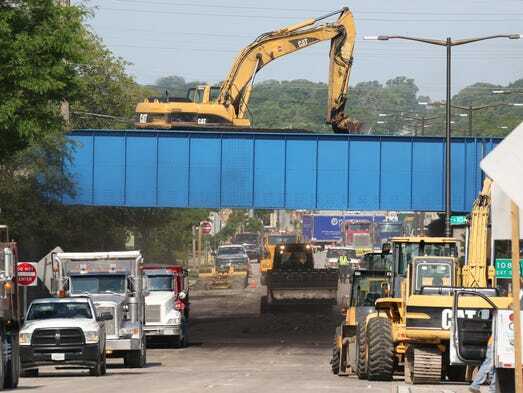 “A couple residents said their houses shook” when the train derailed, Michael May, one of two aldermen for the area of West Allis where the incident occurred, said at the time. Power also was knocked out to about 1,000 homes and businesses west of the derailment. Portland, Oregon (CNN) In the days before Amtrak 501 careened off the tracks last month in a deadly crash, engineers and conductors warned their supervisors that they did not feel adequately trained on the new route, according to more than a dozen sources. Several train cars flew off an overpass, landing on Interstate 5 in the December 18 accident near DuPont, Washington, which left three dead and more than 100 injured. At the time, Amtrak 501 was making its inaugural journey of a new Seattle-to-Portland run called the Point Defiance Bypass route. Engineers and conductors had safety concerns, citing rushed and "totally inadequate" training which left them feeling dangerously unprepared for the new route, according to multiple sources, including several directly involved in the training. Crew members traditionally train on new routes to familiarize themselves with the signs, terrain and other physical characteristics which vary from route to route. The Republican tax bill would result in millions in dollars of cuts to the Railroad Unemployment Insurance Trust Fund and take funds away from out-of-work employees. Tell your senators and representatives to VOTE NO. Next week, the House and Senate are expected to vote on a tax bill that is expected to add $1.5 trillion to $2 trillion to the federal deficit in the form of corporate and individual tax cuts. According to estimates, the Railroad Unemployment Insurance Trust Fund could lose as much as $9 million without any subsequent action by Congress under a 2010 budget process known as sequestration. “Required spending reductions would significantly exceed the total resources available to be sequestered,” said Michele Neuendorf, an RRB labor member counsel, in an email. “This would have the practical result of a 100% sequestration of all non-exempt direct spending accounts including the funds from the Railroad Unemployment Insurance Trust Fund which is used to pay unemployment and sickness benefits.” Under the federal “Pay-As-You-Go” (PAYGO) Act of 2010, changes in federal spending are required to balance or offset any increases to the federal budget deficit (also known as sequestration). As a result, the tax bill would trigger automatic budget cuts across all federal programs including the RRB’s Railroad Unemployment Trust Fund, which is targeted for a 6.6 percent cut or approximately $9 million in the 2018 fiscal year by the administration. “This tax proposal is Robin Hood caught in reverse,” said SMART Transportation Division National Legislative Director John Risch. “It would take from the poor and give to the rich. If the tax bill becomes law, the railroads will still be able to deduct money that they spend on union-busting lawyers while our members will no longer be able to deduct their union dues. The corporate tax rate for the big railroads will go from 35% to 21% while ours will stay the same with fewer deductions.” It also means that $9 million intended for ailing and unemployed rail workers doesn’t go where it was supposed to. Instead it will go into the pockets of corporations and the well-to-do. “Every person in America should be outraged that the Republican tax bill will borrow $1.5 trillion to $2.5 trillion to fund tax cuts for the wealthy while leaving no room for future federal investments toward infrastructure projects such as airports, transit systems, and passenger railroads,” Risch said. “I’ve been in the business of government policy since the 1980s and this is simply the worst tax proposal I have ever seen. Economists across the political spectrum are condemning this plan and the Republicans are so desperate for some sort of “win” they are moving forward with little to no transparency or accountability to their constituents.” Time is running out. A vote is planned for next week. Call your senators and representatives and urge them to vote against the tax bill. Find out who your members of Congress are by accessing the SMART-TD Legislative Action Center by clicking here or call the U.S. Capitol switchboard at (202) 224-3121. On October 6, 2017, the six Rail Unions comprising the Coordinated Bargaining Group (CBG) announced that they had reached a Tentative National Agreement with the Nation’s Freight Rail Carriers. Shortly after that announcement, a Union belonging to a different bargaining coalition began a campaign of misinformation, misrepresentation and outright falsehood in an effort to disrupt and undermine the democratic ratification process of the CBG Unions. Below you will find a link for an anonymous survey regarding the proposed National Rail Contract that is being conducted by DFM Research. All responses are 100 percent confidential (only the final results will be shared with SMART Transportation Division). Please take a few minutes to let us know what you think about the contract and other issues affecting our membership. Click HERE to take the online survey from DFM Research. SMART TD opposes the recent nomination of former U.S. Rep. Lynn A. Westmoreland of Georgia by the Trump administration to serve on the Board of Directors of Amtrak. 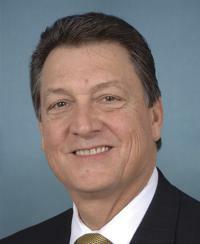 As a longtime member of the House Transportation and Infrastructure Subcommittee on Railroads, Pipelines, and Hazardous Materials, Westmoreland has a hostile voting record against Amtrak, which includes efforts to eliminate federal funding for Amtrak entirely. In addition. Westmoreland has been an original cosponsor of the “National Right-to-Work Act” on multiple occasions, which would significantly weaken our ability to collectively bargain. For these reasons, we oppose his nomination as it would undermine the core mission of Amtrak and its employees. Earlier this year, Trump’s budget proposal to Congress for fiscal year 2018 called for eliminating federal support for Amtrak’s long distance train services, which would result in the immediate loss of 10,000 non-Northeast Corridor Amtrak jobs and the destabilization of the Railroad Retirement trust fund. Our SMART TD Brothers and Sisters in Texas need your help! The catastrophic flood waters caused by Hurricane Harvey have devastated Houston and its surrounding communities with loss of life and immeasurable destruction of property. Some of those affected by the devastation are our Brothers and Sisters of SMART Transportation Division (SMART TD) who live in and near the Houston area. The silver lining is, and will continue to be, the generosity of citizens around the country who are giving what they can to help those affected to reclaim their lives. We are asking the SMART TD family to rise to the call and give what you can so that the daunting task of starting over and rebuilding can begin. Your generous donation will help lessen the struggle and bring real hope and relief to our SMART TD members who are suffering from this great loss. SMART TD will administer donations sent to the UTU Disaster Relief Fund. Questions: Please call the Transportation Division office at 216-228-9400 referencing Disaster Relief.